CONNOR Creagh is the boy who somehow survived a "freak accident" after being crushed by a tree in the "middle of nowhere". 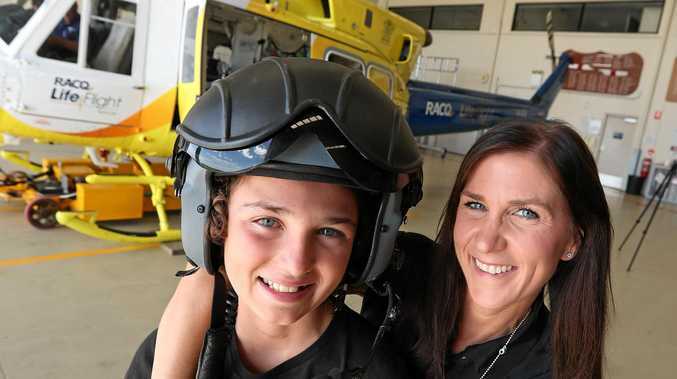 The Sunshine Coast schoolboy had been playing in a fallen tree and his family looked away for a brief moment; the next moment will echo in their minds forever. His mother Danielle Miles remembers hearing a "bloodcurdling" scream and found the tree had trapped Connor from the waist down. Using chains and ropes and a 4WD, the family was able to free Connor from the tree's clutches before emergency services arrived. 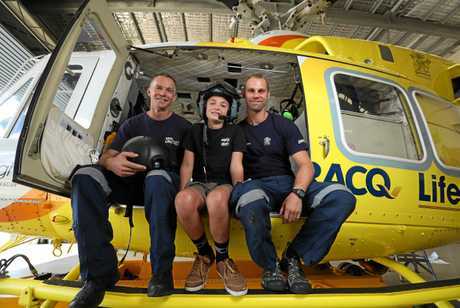 Rescue: Sunshine Coasy schoolboy Connor Creagh and his family reunite with the heroic RACQ LifeFlight team who saved his life. At the time - October 12, 2018 - the little boy sustained major trauma, including collapsed lungs, a squashed heart, broken femur and ribs. Connor, now 12, still bears the scars from the fateful day in October. "Connor was unconscious at the time, we didn't think it was going to turn out well for him at all," Ms Miles said. "He sustained significant injuries. They told me on site to prepare for brain injuries. "He ended up needing a full airway reconstruction. "No words as a parent can describe the horror of hearing and seeing that." Storm had ravaged the region the night before and the family were helping Connor's grandmother at her property. 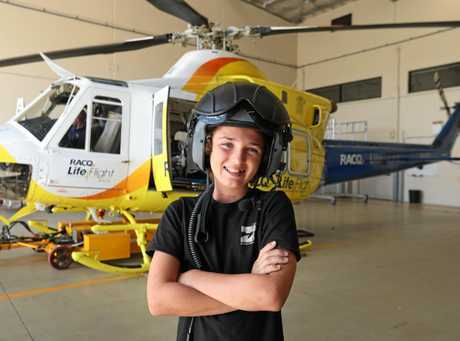 Critical care paramedics and an RACQ LifeFlight Rescue Helicopter crew worked with him at the property for half an hour before rushing him to Brisbane. So remote is the property - between Kingaroy and Nanango - it is a two and a half hour drive to a major hospital. That's when the roads are clear. This morning Connor had an emotional reunion with the men who saved him - Dr Oskar Larsson and rescue helicopter pilot Andrew Caton. "It was so special. I just said 'thank you so much'," the brave boy said. "I remember going to the shops that morning, then nothing afterwards. But I'm feeling pretty happy today." For the medical team, the reunion was a rare moment to savour as Connor showed the ins and outs of the machine that saved him. "So pleased to see him, surprised by it but so happy," Dr Larsson said. "It is always hard to keep the emotion out of it, especially when children are involved. You just have to disconnect. "When you go home you start to ponder on it. That makes seeing him today even more special." His mother held back tears, unable to fully express her gratitude to Connor's heroic guardian angels. To the family, seeing the helicopter approach, meant they were "not alone" any more. "It felt like a massive sigh of relief," Ms Miles said. "No words can describe it, just immense relief. "Without these guys, he wouldn't be here. It's in the middle of nowhere, no way could we have got him to hospital in time. "Connor was really nervous about coming to meet them but it is wonderful. So great to be able to thank them too."